Robert George ’77 was appointed in March to the United States Commission on International Religious Freedom. He is the McCormick Professor of Jurisprudence as well as director of the James Madison Program in American Ideals and Institutions at Princeton. 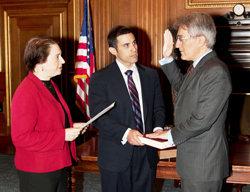 With 40 of his students on hand, including one who held the Hebrew Bible for the ceremony, George (at right in photo) was sworn in by Associate Justice of the Supreme Court Elena Kagan. The commission was created in 1998 through the International Religious Freedom Act and was recently reauthorized by Congress. The nine members of the commission review violations of religious freedom internationally and make policy recommendations to the president, secretary of state, and Congress. George also has served on the President’s Council on Bioethics and the U.S. Commission on Civil Rights. He is a member of the Council on Foreign Relations and a recipient of the United States Presidential Citizens Medal and the Honorific Medal for the Defense of Human Rights of the Republic of Poland.